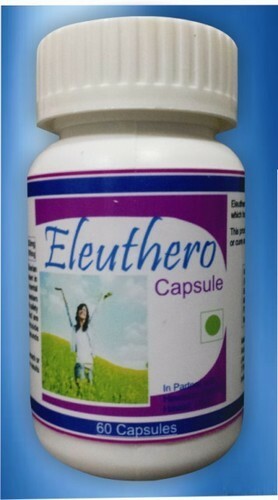 Eleuthero Capsules is an excellent product formulated and designed by Herbal Natural care Ltd, an ISO 9001:2008 certified company in partner with Hawaiian Herbals located in Hawaii, USA. This is a HALAL & KOSHER certified product & produced under International GMP regulations. It containsEleuthero sinensis popularly known as Siberian Ginsengis a powerful adaptogenic herb. It has been carrying a plenty of benefits in eastern medicine for thousands of years enjoying a history of both safety and effectiveness. The Eleuthero root used in this product is carefully selected based on high eleutheroside concentration, the plants active therapeutic compounds delivering maximum effectiveness. · Siberian ginseng is often called an adaptogen, strengthen the body and increase general resistance to daily stress. · Siberian ginseng is used for conditions of the heart and blood vessels such as high blood pressure, low blood pressure, atherosclerosis, and rheumatic heart disease. · It is also used to boost the immune system, prevent colds, flu, and increase appetite.